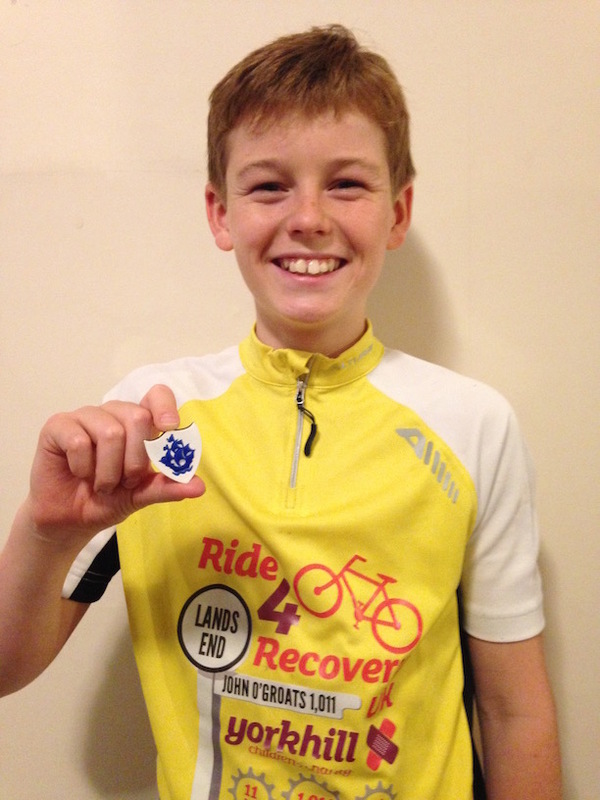 Riding Land’s End to John o’Groats is certainly on many people’s bucket lists but 11-year-old CTC member Patrick Kiehlmann can already tick it off his. I can’t believe it, only 10 days to go before voting closes in the JustGiving Young Fundraiser of the Year 2015. 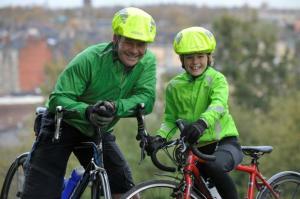 Please vote for me, Yorkhill Children’s Charity and cycling! We are thrilled to announce that our incredible young fundraiser Patrick Kiehlmann has been selected as a finalist for the Young Fundraiser of the Year Award in the JustGiving Awards 2015. At the age of 11, Patrick cycled from Lands End to John ‘O’ Groats in 11 days just one year after recovering from a ruptured appendix. He has raised over £5,000 for the Yorkhill Children’s Charity to show this appreciation for the wonderful care he received while at the Royal Hospital for Sick Children, which saved his life. There were over 10,000 nominations for the JustGiving Awards 2015, so we are absolutely delighted that one of our super supporters has been recognised for such an amazing achievement. We are all behind Patrick, and hope that all of Team Yorkhill will show show their support by voting for him here! Fantastic night, great to see, meet and hear about so many inspiring young people in Scotland, can’t wait to meet many many more……. Young Scot 2015 Finalist – What an honour! Eleven-year-old cycles Land’s End to John o’Groats – in 11 days! During his half-term holiday, 11-year-old CTC member Patrick Kielhmann has cycled from Land’s End to John o’ Groats in 11 days. Patrick conquers LEJOG at age 11! 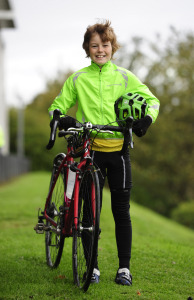 Patrick Kiehlmann (11) of Bishopbriggs has set his sights on cycling one of the most iconic and challenging routes in the UK, Lands’ End to John O’Groats. He has taken on this huge challenge to raise funds for Yorkhill Children’s Charity who help support the children and babies from all over Scotland who are treated at Yorkhill Hospital in Glasgow. It was only two years ago in April 2012 that Patrick suffered life threatening complications while being treated for a ruptured appendix at Yorkhill Children’s Hospital. Without the expert care and dedication of the staff, Patrick would not be with us today. 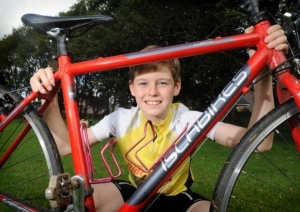 As an extremely keen cyclist Patrick wanted to find a way to help other children receiving treatment at Yorkhill whilst setting himself a new cycling goal. At 5 years of age Patrick completed the ‘Pedal for Scotland’ cycle challenge from Glasgow to Edinburgh, 50 miles in around 5 hours. At 10, he completed a Sportive, 110 miles in just under 10 hours, taking in more than 2,000m of ascent, more than twice the height of Ben Lomond. Each year in March Patrick’s school takes part in Sustrans Big Pedal, where the children log their journeys to school over 10 days against a virtual Tour of Britain. Patrick decided that he would like to try it for real, see some sights and have his own Tour of Britain. The Lands’ End to John O’Groats challenge will see Patrick take on an average of 89 miles a day for 11 days alongside his proud dad Mark. Kirsten Sinclair, head of fundraising at Yorkhill Children’s Charity, said: “This is an extremely ambitious challenge for any cyclist to take on, let alone an 11 year old! Patrick is clearly a very brave young man and represents the sort of determination and bravery we witness on the Children’s Ward every day at Yorkhill so we were thrilled when he said he’d like to help raise funds for Yorkhill Children’s Charity. For further information, please contact Rachel Woodford at Media House on rachel@mediahouse.co.uk or call 0141 220 6040. Many sick children spend days, months and years attending Yorkhill Hospital, some with minor ailments and some fighting for their lives. Yorkhill Children’s Charity sits firmly at the heart of the hospital and works tirelessly doing all that it can to make these difficult times easier for the children and their families, helping to give them the best chance of making a full recovery. From a broken arm to end of life care, from simple play activities to innovative medical equipment and ground breaking paediatric research, our driving passion is to fund initiatives that help to save or improve the life of a child and by association positively affect the lives of their family. None of this would be possible were it not for the donors, fundraisers and volunteers who have enabled the charity to help support the hospital and related services over the years.